Sendy is a self hosted email newsletter application that lets you send trackable emails via Amazon Simple Email Service (SES). This extension integrates your Easy Digital Downloads store with Sendy by letting you automatically subscribe customers to specific lists based on what they purchased, and allowing customers to opt themselves into a list during checkout. This documentation assumes that you already have a Sendy installation set up and ready to use. If you don't have a Sendy installation ready to go, there's a great guide available to help get you started. To configure the Sendy Add On you will need to complete its settings. 2. Scroll to the Sendy Settings section. 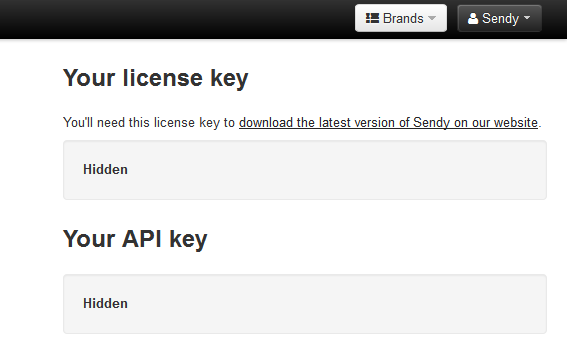 The Sendy API Key must be acquired from the Settings page of your Sendy installation. - In the top right corner, click on your Account Name drop down and choose Settings. - On the right side of the page, highlight and copy the text found under "Your API key". - Return to the Sendy Settings section on your EDD store website under Downloads > Settings > Extensions and paste/enter the Sendy API key into the Sendy API Key field. 5. The next option "Show Signup on Checkout" allows your users to opt in to subscribe to your newsletter on the checkout page. When enabled, a check box will appear on the checkout page that asks your users if they would like to join your newsletter. When disabled, your users are automatically subscribed to the newsletter that you have chosen in your settings without being prompted. 6. In the field labeled " Enter your list ID", enter the list ID you wish to subscribe buyers to. This encrypted & hashed ID can be found under the " View all lists" section of your Sendy installation once you create your first newsletter list. 7. Add a short appropriate description in the "Checkout Label" field. If left blank the buyer will see a checkbox with a default label, "Signup for the newsletter." 8. Click the "Save Changes" button at the bottom of the page. You can subscribe customers of specific products to one or more Sendy lists by going to the product edit screen and entering the list IDs that you wish customers to be added to in the "Sendy" box. If you'd like to subscribe the user to multiple lists, separate the list IDs with a comma character ","